Settle, as Chance decides where how and when. 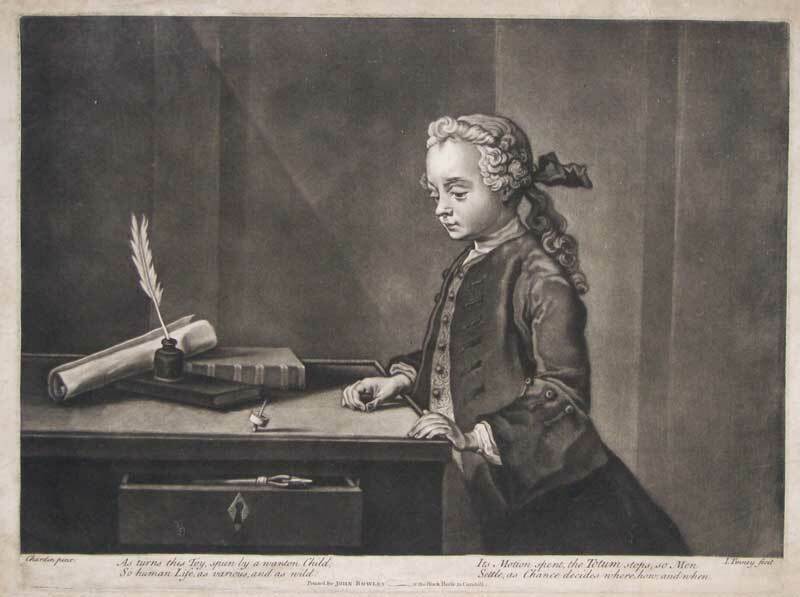 A charming and scarce mezzotint engraving by Tinney after Chardin; published in London by John Bowles circa 1755. John Tinney lived and worked in London as an engraver and print publisher but also appears to have worked in Paris. This might explain his connection with the French artist, Jean Baptiste-Simeon Chardin (1699-1799). Chardin's work is characterised by genre scenes that depict domestic subjects in carefully balanced composition. This endearing scene shows a small boy playing with his spinning top. The verse below gives allegorical meaning to the toy comparing the totum's motion and ultimate toppling with the unpredictability of human life.